Although we'd all love to have a million pound wedding, the cold hard fact is we don't all have the funds. But don't be discouraged, blushing bride. A dream wedding can definitely be achieved on a budget. In fact, here are 21 cute DIY decor ideas that will help save you a ton on your big day. When it comes to throwing the lavish wedding you've imagined ever since you were a little girl, you'll quickly find that every little thing adds up. Before you know it you'll be looking at a twenty thousand pound bill, and you're going to contemplate selling your soul to get the finest of fine china. But don't do it, girl. There aren't any refunds on that soul of yours. Instead, spare your bank account and try opting for these very pocket-friendly DIY decor ideas for your wedding. Mason jars are clearly having a moment and simply because they're awesome. Here they make for the perfect aisle decor. Just add some flowers and hang 'em on the chairs. Why spend loads of money on centrepieces when you can get down and dirty while making your own? It all starts with blowing up a balloon and wrapping several sets of thread or yarn around it. Then spray fabric stiffener on top. Once fully dry, pop the balloon. Not so much "decor", but definitely a fun idea. As a gal who loves high heels, yet refuses to stay in them longer than two hours, this is something I'd be eternally grateful for. Your girlfriends will also thank you. TRUST me. Set up the basket in a corner in the reception hall and watch as magic happens. Add some fibre cloth to your impossibly vivid flowers, and just like that you'll have an autumn-perfect bouquet. Yes, even your chairs deserve to get pimped out. Grab some ribbon and have an ombre good time putting your crafting skills to work. Well, there goes a new way to use flowers. If nothing else, it will certainly give your guests something to talk about. Cute huh? All you need is some tissue paper, floral wire, and ribbons. Hang these anywhere you'd like. Instead of costly linen, string together a table runner filled with flowers. Don't be afraid to opt for cost friendly blossoms as well. Super simple, yet great to look at. Ok, you guys... How adorbs is this? Need a way to number your tables? Print 'em out in a fancy font, then insert into your frame of choice. Chalkboards are no longer reserved for classrooms and Happy Hour specials. Here they take a romantic twist. The sparkle will go well beyond your awesome dress with glittered tea light holders. They'll up the posh factor without breaking the bank. Twine, white boxes, and floral boxes have never looked better. Send your guests away with a little something to remember your big day. Come on, how precious are these candlestick centrepieces? I mean, really. 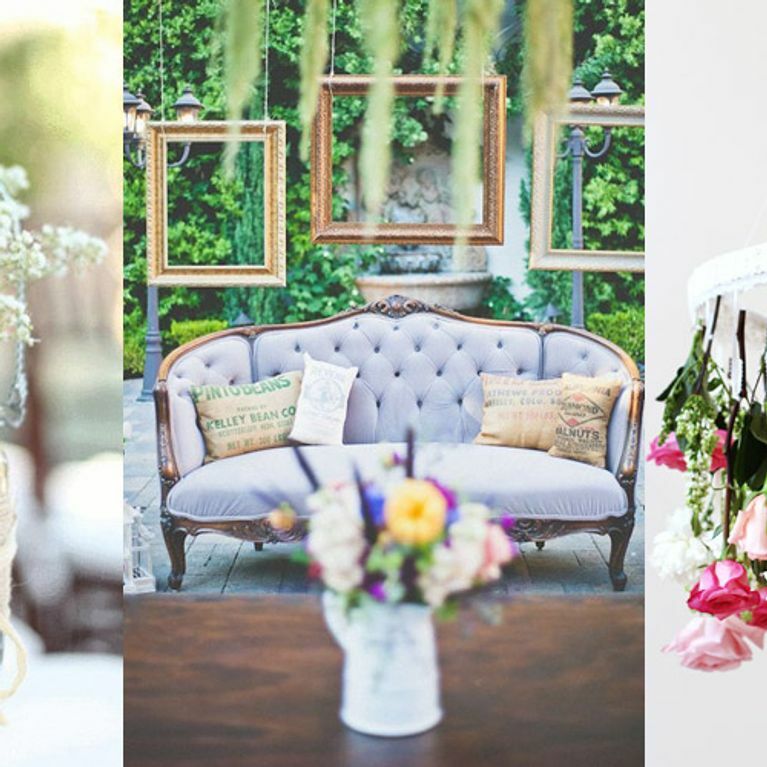 Use hanging vintage frames to add major atmosphere to a backyard wedding. P.S. This looks like a scene out of a movie, right? Grab some doilies and Christmas lights, combine, and boom! Mood set. A set of Poundland vases gets an instantly fresh upgrade with fruits. These are perfect for the health nut couple and super cost efficient. So stunning. The best part? All you need is some acrylic glass, spray paint, and markers. So modern. So cool. So everything. This is just about the best use for receipt paper I can think of. Not to mention it makes for great photos! Do you have any DIY decor ideas for a budget wedding? Tweet us @sofeminineUK!